A Light Between Oceans. Burj Al Arab and Jumeirah Beach at Sunset. I got this idea from one spontaneous traveler. He would spin a globe and stop it with his index finger. He will look at the place where his finger had landed and then pack his bags or suitcase quickly to go to that place. I did the same thing. My finger landed somewhere in the Gulf (or purposely made it land there) and decided that it’s Dubai. At least it had to be because it’s the only place I know that is within that neighborhood. So I literally ran to the airport and fly to Dubai right after that. Of course I am just kidding. 🙂 I believe I planned this all along and I am not a spontaneous traveler. My passport is not really one of the strongest in the world, so traveling to Dubai is a challenge. Besides, the Middle East (or Western Asia) is a dream (up until now) and way over my travel budget. Looking back now, it was not also the best time to visit the place. Summer has started and it was 40 degrees during the day; with the heat a different kind of painful on the skin and the air a bit stifling and suffocating for first timers. But it was also the time to take advantage of lower hotel rates and speedy Visa processing. I lodged in my Visa application on a Saturday afternoon and got the Visa the following day (a Sunday). So if you don’t mind staying inside malls during the day (which I am sure you don’t), early summer is a good time to visit this wonderful country. I am doing quite well at the moment, happy and busy with work; having found a job in a new company with a more positive atmosphere. I am inspired again and I can draw again; doing now what I believe, the things I was always meant and supposed to be doing (with the added bonus of deciding for myself which direction my projects should go, which maximizes my time) and still manage to squeeze in a bit of time-off from work. A big project was coming up over the horizon and I needed to prepare for that one. So despite my busy schedule, I decided to go to find fresh inspiration and do something else other than my architectural work (in this case, to practice photography). 🙂 And what is a better place to find inspiration in architecture and to do travel photography than in Dubai? The Fountainhead. Burj Khalifa and Souk Al Bahar at the blue hour. I’ve read somewhere that Dubai can be viewed in two ways: either as a stopover destination for people traveling to Europe (if you’re coming from Asia), or a place where you can do something different or impossible. I have to agree. I really love spending time in stopover and day trip destinations because it’s in these destinations where you will find the most interesting places often overlooked by travelers and day trip packages. Impossible is also a word that you will not find in the Emirati’s dictionary. Dubai is preparing to host the 2020 World Expo, so a lot of architectural projects are pretty much well on their way; most of which are without precedent. Arabian Nights. The beautiful Madinat Jumeirah at night. 1) Deira and Bur Dubai: Deira is one of Dubai’s oldest districts oftentimes overshadowed by the glitz of the modern city. Built around Dubai Creek, its most prominent feature is the cluster of souqs (or markets) connected by narrow lanes and alleys which can be very busy in the late afternoon (particularly the Gold Souq). The Abras (traditional wooden ferries) are still in use here today; not so much for transporting merchandise but for sightseeing along Dubai Creek. Bur Dubai provides you with a glimpse of Dubai’s past. Take a tour around the beautifully restored Al Fahidi Historic District and understand Dubai’s beginnings at the Dubai Museum housed inside Al Fahidi Fort. 2) Burj Al Arab and Madinat Jumeirah: Burj Al Arab (perhaps Dubai’s most recognizable and iconic building; and the only 7-star hotel in the world) sits along the beautiful coast of Jumeirah Beach. Madinat Jumeirah (another recent development) is a modern rendition of a traditional Arab village built around an artificial river flanked by palm trees and signature restaurants. Don’t miss Burj Al Arab at sunset and see Madinat Jumeirah at night when the buildings are beautifully lit with Burj Al Arab in the background. 3) Downtown Dubai: Burj Khalifa towers over Downtown Dubai, the city’s main urban hub and a major destination for sightseeing tourists. Climb your way to At The Top (Burj Khalifa’s observation deck at the 124th and 125th floor) and experience the exhilaration of standing on top of the world’s tallest building. Dubai Mall (the mother of all malls as they call it) is nearby with its overwhelming 1,000 or more shops. Adjacent to Dubai Mall is the equally handsome Souk Al Bahar, with its grand colonnaded atrium and signature restaurants, most of which have enviable views of Burj Khalifa and Dubai Fountain at night. 4) Dubai Marina and Palm Jumeirah: Dubai Marina is a posh private residential development and provides you with a glimpse of the Dubai high life. The best way to experience the Marina is by walking along Marina Promenade in the evening where you pass by fancy restaurants and berthed yachts set against glimmering high rise buildings. Opposite Dubai Marina Beach is Palm Jumeirah, a palm-shaped artificial island jutting into the Gulf; with several residential and commercial developments along the Palm’s fronds. At the tip of the Palm along the outer crescent is Atlantis The Palm (another hotel development) and the adjacent Aquaventure Waterpark, a family theme park. Morning Calm. A view of the Mapo gu area in Seoul from my hotel room. And I was not disappointed. It was not really the best time to visit this place though. We did miss the spring blossoms (since my daughter had to wait for the school year to end before we could get here) but the weather was the most pleasant with the air still cold and chilly despite the sky being bright and sunny (the closing of spring and the beginning of summer) which made this trip one of the most memorable. This is one of those places that lightning gets to strike only once. But unlike lightning however, tourists make it a point to hit this place at least twice in their lifetime. How can you blame them? Seoul is one of the most beautiful and tourist-friendly places on the planet (at least in the region I have visited). It is a shopping haven for travelers (you ask the ladies) and a food mecca for the adventurous. The locals are the most friendly; going the extra mile to make the tourist experience memorable and speaking the most sweet-sounding of all languages (even though I didn’t understand). I apologize for that. Maybe we listened to too many Korean songs and watched too much Korean drama while we were there 🙂 . It is a very lovely and picturesque place with old neighborhoods preserved and nestled within a modern and bustling metropolis; with different seasons providing new perspectives on every familiar scene. Despite the ravages and destruction of war, Seoul has come a long way to emerging as one of the world’s 21st century cities. This is one model city enjoying a comeback that should not be missed. Old and New. The beautiful Bukchon Hanok Village with the modern Seoul city in the background. You have to believe me. The photos in this post don’t do justice to the ultimate bliss of actually being here. I originally wanted to do several posts about this trip with each post corresponding to each day I spent here; but then decided not to. As much as I wanted to relive the experience, I also did not want the memory to linger any longer than it should. It is one of those “I-wanted-to-stay-but-I-had-to-leave” situations you sometimes find yourself in. Again, too much of that Korean drama 🙂 . Besides, I also messed up my itinerary for my personal photowalk and committed the grievous sin of seeing most of the places I planned to shoot but actually forgetting to shoot some of them. It is because the place is so beautifully distracting and the local food so sweetly unnerving. All those preparations and plans to photograph the place with a fresh pair of eyes and from new angles all went down the drain. I just simply didn’t care about doing original photography but just immersed myself in the moment. I don’t even remember ever complaining about long walks and large crowds. It was a welcoming change from previous tropical ramblings. What am I talking about anyway? Okay, I’ll spare you the Korean drama. This is one place you definitely have to see. But don’t take my word for it. You just have to be here. I am trying to make sense and order out of a disorganized bunch of random photos from my distracted photowalk and trying to write the names of places and their descriptions as I remember them. So I share them here: my must-see places in Seoul (the Seoul I love); not in the order of their importance but in the order I found them worthy to be salvaged from my camera’s memory card 🙂 . Enjoy the images and stay inspired. Gyeongbokgung Palace: Gyeongbokgung is the largest of Seoul’s four main palaces and perhaps the most recognizable of all the city’s attractions. It has served as the principal residence for Korean royalties. Much of the palace’s structures were destroyed during the 20th century Japanese colonial rule. What you see now are mostly accurate recent reconstructions. Take time to walk through the palace grounds beyond the Throne Hall to admire two beautiful floating pavilions: Gyeonghoeru and Hwangwonjeong. Geunjeongjeon. The Imperial Throne Hall of Gyeongbokgung Palace. The highly-prized Gyeonghoeru Pavilion on an artificial island inside the Gyeongbokgung Palace grounds. Hwangwonjeong or “The Pavilion of Far-Reaching Fragrance” on an artificial island inside the Gyeongbokgung Palace grounds. Ehwa Womans University: This is one impressive and imaginative piece of contemporary architecture I have seen during my stay here. A sloping causeway dives six stories below ground level to the main entrance of this facility and is flanked on both sides by glass and steel fenestration. The causeway is terminated at the opposite end by a flight of stone steps leading back to the Gothic style campus buildings at the ground level. Ehwa Womans University is one of the most beautiful and unique works of architecture at the heart of Seoul City. The six-story high stone steps leading to the campus grounds of Ehwa Womans University. Seoul City Hall: The recently redeveloped Seoul City Hall embodies the modern interpretation of traditional Korean architecture. The curved top of the new glass and steel building resembles the roof of old palaces and temples. Underneath its shade is the beautiful stone-cladded old City Hall building. The modern and respectable Seoul City Hall at the blue hour. Deoksugung Palace: Also called “The Palace of Virtuous Longevity”, Deoksugung is one of several main palaces built during the Joseon dynasty. It is the only palace ground that is open until late evening so you could admire the buildings when they are illuminated. The highlight of this attraction is the unusual mix of traditional Korean and Western Neoclassical buildings within a single palace ground. Junghwajeon. The throne hall of Deoksugung Palace. Seokjojeon. One of the Western Neoclassical buildings inside the Deoksugung Palace grounds. Cheonggyecheon Stream: This famous stream of the Joseon era was once covered by an elevated highway that was built after the Korean War. In 2003, the highway was removed as part of an urban renewal project to restore the stream to its present state. The stream is 11 km. long running through downtown Seoul and passing under 22 bridges with several attractions along its entire length. A River runs Through the City. Cheonggyecheon Stream provides a soothing contrast to the surrounding urban jungle. Breathe Again. A view of Seoul city from the base of N Seoul Tower above Namsan Hill. Love Locks. Beautiful and assorted locks adorn the railings at the base of N Seoul Tower above Namsan Hill. Bukchon Hanok Village: Walking through the alleys of this village feels like going back to the time of Korean kings, dynasties, and royal subjects. Bukchon is a cluster of traditional Korean houses (or hanoks) nestled between two main palaces at the heart of an urban city. Some of the houses were recently converted to small coffee shops, restaurants, and homestays for tourists who want to be near major local attractions. Time Passages. A view of one of the picturesque alleys of Bukchon Hanok Village. Some Sevit and Banpo Rainbow Bridge: Some Sevit is a cluster of contemporary flower-themed buildings set on a man-made island off Han River. The buildings house restaurants and a number of multi-purpose spaces. Come during the blue hour to admire the buildings when illuminated by color-changing LED lights. Next to the buildings is Banpo Rainbow Bridge (the world’s longest bridge fountain). At night, colored lights illuminate the fountain as it sends up jets of water into the air with synchronized music. Some Gavit. The convention and corporate events venue of the Some Sevit community. Some Chavit. The dining and restaurant venue of the Some Sevit cluster. Banpo Rainbow Bridge with the lights and water show at night. National Museum of Korea: The simple but impressive exterior doesn’t divulge much of the diversity of exhibits found in its interior. The stories and cultural treasures within its walls are topics that require a separate discussion. The lush garden and beautiful park outside the museum provide a calm and soothing contrast to the rigid and stately character of the buidling. Afternoon Calm. Lush landscape softens the hard-edged and imposing but beautiful National Museum of Korea. Putra Mosque at twilight. Putra Mosque is the principal mosque of Putrajaya. This is another one of those times when you get to choose last-minute holiday destinations. We took one week off in the office to celebrate the Chinese Lunar New Year. At the back of my head, I was hoping that our company would send us to somewhere really cold or even exotic to spend the one-week holiday (like what our company usually do). Well, that didn’t happen this year. The announcement came in a bit late so most of us had to scramble and decide whether to go back to our respective hometowns or go somewhere else. The plane ticket to my hometown (Manila) could get a little pricey this time of year, so I just decided to go to nearby Malaysia. It seems that Malaysia for me is the default destination for long weekends and short road trips; for obvious reasons. From Singapore where I am staying, it is only a few minutes or hours away depending on your destination. Architecture, food, historical sites, beaches, nature, or theme parks; Malaysia has all that and more. You choose. Seri Wawasan Bridge. One of the most beautiful bridges in Malaysia using the latest cable-stayed technology. Kidding aside, these places are too good to be just day-trip destinations that you could stamp on your passports to be used as bragging rights. Much is to be appreciated and learned from the stories of these places and how they came about. Just a few quick facts about Putrajaya: Putrajaya is Malaysia’s “Intelligent Garden City” and its Federal Administrative Center. A vision of establishing this new Federal Government Administrative Center to replace Kuala Lumpur came about in the early 1970s. The relocation was to help decongest Kuala Lumpur and to ensure that KL can develop and focus on being Malaysia’s principal business and financial district. A 4,900+ hectare palm oil plantation in Selangor’s southern Prang Besar estate was later earmarked and called Putrajaya (in honor of Malaysia’s first Prime Minister Tunku Abdul Rahman Putra Al-Haj). The main feature of the city is the responsible integration of man-made elements with the natural environment; a city that integrates technology, culture, and nature. Manicured parks, greeneries, and bodies of water create natural separations between the business and residential sections of the city. The highlight of the trip for me of course would be the city’s architectural wonders which feature Malay and Arabic influences; and which form part of Malaysia’s National Heritage. These are evident in the city’s several mosques, bridges, and public buildings some of which I have featured below. Putra Mosque: Putra Mosque (or Masjid Putra) is perhaps for me the architectural centerpiece of Putrajaya. The mosque is distinguished by its pink dome and rose-tinted granite exterior. The mosque can accommodate 15,000 worshipers at any one time and also houses function rooms and learning facilities. Putra Mosque at the Golden Hour. Seri Wawasan Bridge: Seri Wawasan is one of the most beautiful bridges in Malaysia built with the latest cable-stayed technology. The bridge is enhanced and illuminated at night by the changing colors of the street lights below it. Web of Lights. Seri Wawasan Bridge at night. Seri Gemilang Bridge: This bridge serves as the main entry route to the city core. The bridge focuses on very fine Islamic motifs and detailing which emphasize Malaysia’s Muslim faith and culture. The bridge also leads to Putrajaya International Convention Center (PICC) which is located at the southern part of the city. Seri Gemilang Bridge with Putrajaya International Convention Center (PICC) at the background. Masjid Tuanku: Masjid Tuanku or “The Iron Mosque” is Putrajaya’s second principal mosque. Slightly larger in floor area than Putra Mosque, it can accommodate 20,000 worshipers and caters mostly to the government workers from the nearby city center and residents from nearby precincts. Masjid Tuanku (The Iron Mosque) at the blue hour. Perbadanan Putrajaya: Also called Putrajaya Corporation, it is the local body that administrates the Federal Authority of Putrajaya. Framed within the arch of the building is Istana Kehakiman (or The Federal Court) which is the highest court and final appellate court of Malaysia. Perbadanan Putrajaya at night with Istana Kehakiman (The Federal Court) framed in the background. The best way to get to Putrajaya is to take the KLIA Transit train from Kuala Lumpur International Airport and alight at Putrajaya / Cyberjaya Station. From the bus interchange at the station, buses can take you to the different routes within the residential, commercial, and government precincts of the city. The bus routes could get a little complicated for a tourist. So for the most part, I took a taxi (available 24 hours) to get to the locations I plan to shoot. Cost is reasonable since the hotel is just near my planned shooting locations. So there you go. My first photo walk for the year and happy to have made use of the time given to us; and even happier to start the year doing the things we love the most and care passionately about. I am currently looking at traveling outside the region which might take a while to happen because of some logistical concerns. Meanwhile, enjoy the images as much as I do as well as the New Year. A Thai Welcome. Mythical creatures at the Wat Phra Kaew Temple Grounds. Finally, I ran out of sensible things to say except maybe to tell you about the series of crazy and unbelievable events that led me to this place and made me love it. Bangkok was one of the last cities I planned to visit. I have always loved the city and architecture which is quite evident in the subject matter of my photographs. I honestly was never fond of shopping, night markets, night life, and the beaches which I have always associated with Thailand (or even Bangkok). Did not really like ocean cruise holidays or water sports either (most of my friends live on land ). 🙂 A colleague however did a good job of documenting her last visit to Bangkok (her birthday) and with her interesting photos of the food and a convincing story of satisfaction, I was sold. So I found this attractive deal at a hotel booking site. Now because I was used to paying hotels when I actually get there, I was immature enough to assume that this one will allow me to do the same. After clicking the “Book Now” button, I realized that I just paid the hotel in full. Immediately, I lost a few hundred bucks. So after that, you can just imagine how I really struggled just to make it to the end of the month. Needless to say, this journey to Bangkok has officially started. Then there was this APEC summit in Manila (my hometown). I am not used to travelling alone and have always promised my wife and my daughter that whenever I get a chance, I will meet them in some part of the world and we’ll explore that place together. But because of this summit, most flights coming out of Manila for that week have been either cancelled or rescheduled to give way to incoming APEC delegates (I didn’t see that coming). So that meant my wife and daughter will not be able to meet me in Bangkok. With the hotel booked, my air ticket already paid, and no more time for adjustments, I had to journey on my own. Arriving at the hotel in Bangkok, I was told that I was given a free upgrade. The small room I booked for three persons was upgraded to an entire flat. The hotel was really kind enough to do that; having thought that I will be bringing my family along with me (Now I know why they call Bangkok “The City of Angels”). 🙂 So I had the entire flat for myself. I actually slept in every room of the flat for each night of my 3-day stay there just to make use of the large space. Honestly, I don’t know of anybody silly enough to do just that. Bangkok Jam. Capturing rush hour traffic at Bangkok CBD. Now, I was wrong about Bangkok. Dead wrong. The city itself was a big surprise. It seems like anything is possible here. Bangkok is a dizzying and dazzling array of contrasts, extremes and superlatives: Speedy skytrains gliding past slow moving traffic; megamalls competing with shophouses for tourists and customers; sweltering tourist spots alongside refreshing sidewalk restaurants; and ultra modern high-rise buildings perched above ubiquitous traditional Thai temples. And of course, modern shopping centers versus the weekend market and bazaar (the highlight for most tourists). My hotel was even situated near a quiet urban park; a respite from the buzz of the busy urban hub. In busy Bangkok, a place like this seems like an aberration. Not to forget the food that tops off the tourist experience. Bangkok Modern. High-rise office towers at the Chong Nonsi BTS Station in Bangkok. I came in at around noon so I decided to spend the rest of the day at Chinatown and visit Wat Traimit. Wat Traimit is the temple of the Golden Buddha. I read somewhere that there are lots of gold in Chinatown, but it will not be enough to recreate this jaw-dropping, giant, solid gold statue which weighs around 6 tons and with a current value of approximately US$250 million. Time is gold, so take the time to appreciate this impressive gold statue sculpted in the beautiful Sukhothai style. The Golden Buddha is seated at the 4th floor of Phra Maha Mondop, the compound’s beautiful marble structure. The best way to reach Wat Traimit is to take the Metro to Hua Lamphong station (exit 1). From there, go by foot. You might need to ask some locals for directions as the temple is not in a conspicuous location. The problem with major tourist spots are the tourists. 🙂 There must have been fifty busloads of tourists that day at Wat Phra Kaew and The Grand Palace. If you love photography (or selfie), it may take a while to get a clean shot of anything; one with less tourists in your photos. But here, I guess it’s impossible even on a weekday. So by actually being there, you just added to the problem. 🙂 The magnificent architecture and the grandeur of the temples and palace however were enough to hold my attenton and to forget the heat and the crowd. 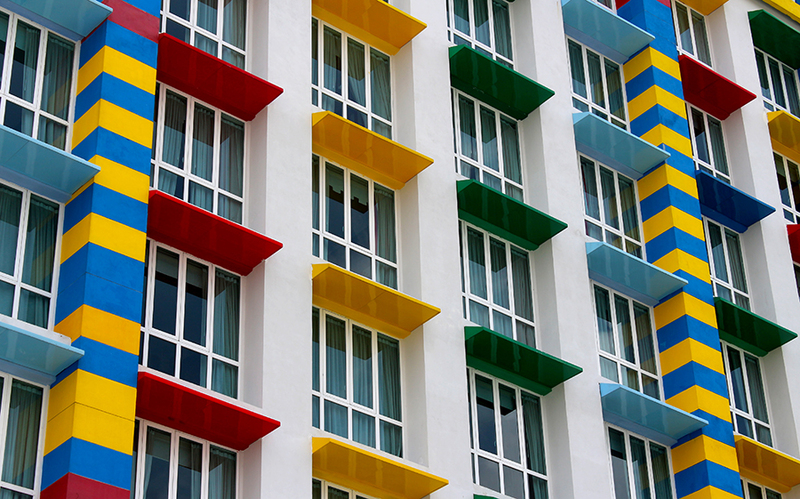 The level of architectural detailing was unbelievable and the colors so vibrant that they make for wonderful photos. I have a handful of Thai colleagues back in the office and now I am not surprised why they are so creative and have such keen attention to details. My two cents: Arrive early on a weekday and beat a lesser crowd. Don’t miss the Emerald Buddha and wear pants or long skirts while within the premises. Bring lots of drinking water. The best way to reach Wat Phra Kaew and The Grand Palace is to take the ferry ride along the Chao Phraya River from Bangkok’s Central Ferry Station to Pier No.9. Among all the attractions, I’ve read Wat Pho perhaps holds the most notches in its belt. It is the oldest and largest Wat in Bangkok. It has the largest (or longest) and only Reclining Buddha. It has the biggest collection of gilded buddhas (gold plated buddhas in the lotus position) and the most number of stupas and smaller temples within its temple grounds. And if I may add, it is the only tourist spot that provided free bottled water for visitors. 🙂 But it actually felt it has lesser tourists compared to nearby Wat Phra Kaew and The Grand Palace. But it should never be missed. My other two cents: Don’t miss the Reclining Buddha and take the time to ramble through the minor structures beyond the inner walls of the temple grounds. Like most major tourist spots, Wat Pho can be reached by taking a ferry ride along the Chao Phraya River from Bangkok’s Central Ferry Station to Pier No. 8. Surprisingly, I found extra time in my hands. So I decided to spend my last night (a Friday) in one of Bangkok’s rooftop bars (a photographer should always take home at least one aerial photo of each new city). 🙂 There is never a shortage of rooftop bars in Bangkok. With hundreds of hotels in the city competing for tourists, the quality of most rooftop bars can only get better. I decided to try Cielo Skybar. It’s not on the top of the list but the food here is great and reasonably priced; with lesser people even on a Friday. The seats are widely spaced allowing for other people to stand in between and view the city below. The sunset view is magnificent and unobstructed with the Chao Phraya River beyond bathed in golden light. But since the bar is located in a somewhat suburban district, it has less of the iconic Bangkok high-rise buildings that would make for a wonderful twilight photo. But if you’re into food, sunset, and a relaxed atmosphere, this is the right place. Head Rush. Bangkok sunset viewed from Cielo Skybar. I will be adding more photos from this Bangkok trip here in this link. Enter My Dreams. 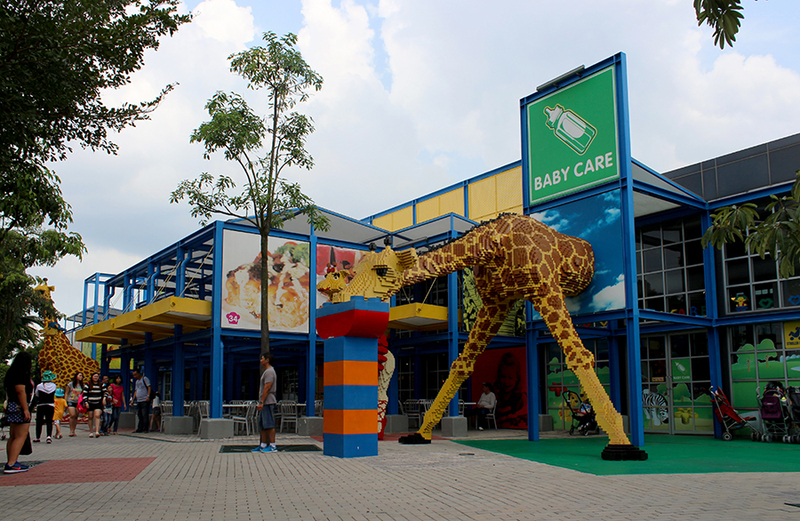 The gateway to Legoland Malaysia. Surprisingly, the place was not as crowded as I had expected. 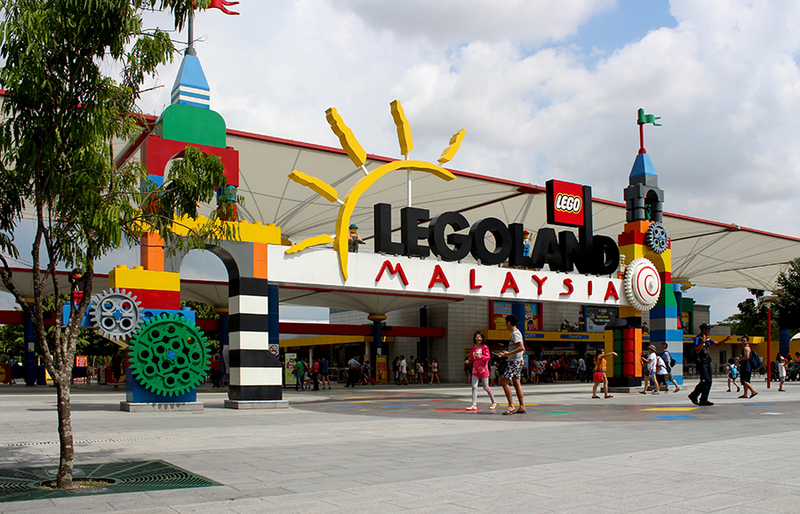 This day trip to Legoland Malaysia just happened without much planning. To be honest, it was a result of simply having nowhere else to go. 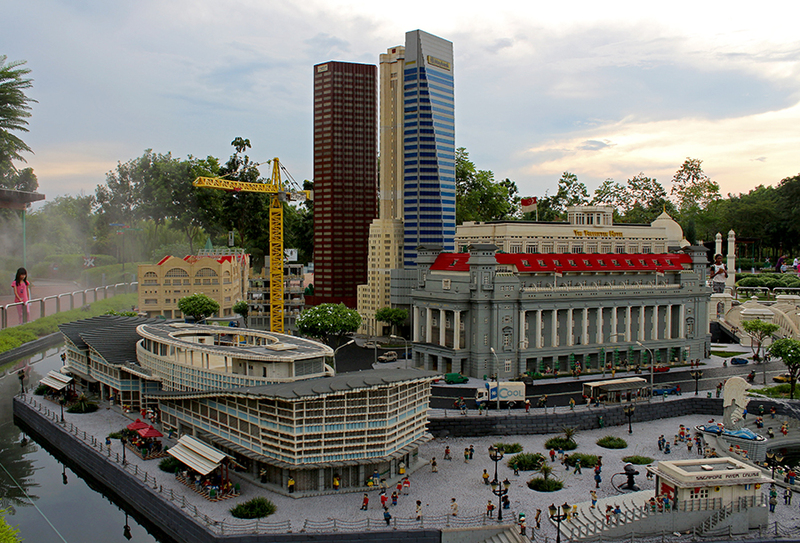 Legoland Malaysia is just a 1-hour bus ride from Singapore (where I am currently based) so it’s funny and embarrassing to admit that it was one place that I had yet to visit. I finally got my chance during a public holiday. The holiday fell on a Friday and I suspect some office colleagues already planned their long weekend somewhere really nice. And here I am. Stuck. I needed to go somewhere too. Somewhere. Anywhere actually. Legoland Hotel. Stay close to the action by checking in at this hotel located just across the park. The interior of this hotel is a theme park in itself. But honestly, maybe at the back of my mind I already had a reason for visiting this place. I wanted to go back to how I started; on how I became an architect in the first place. When I started this blog, I was hoping to share about photography and the places that I will be able to visit; with perhaps a detailed account of what I will do and eat during each day of the trip in those places. It’s what most bloggers do :-). And believe me, I wanted to do the same. But then, I realized you might as well buy a travel guide. The accounts about the places (and the food) will be more convincing. One of our life coaches taught us the lesson of the empty cup. It’s a reminder to be teachable; on not to think so much of yourself as someone who has already arrived; and not to underestimate the power of a small person or place to teach or remind you of something important. That happened to me here. So, may I request that you indulge me once more in sharing my gleanings on this recent road trip and I promise next time, I will write about what most bloggers write in their blogs :-). Thank you very much. Color My World. 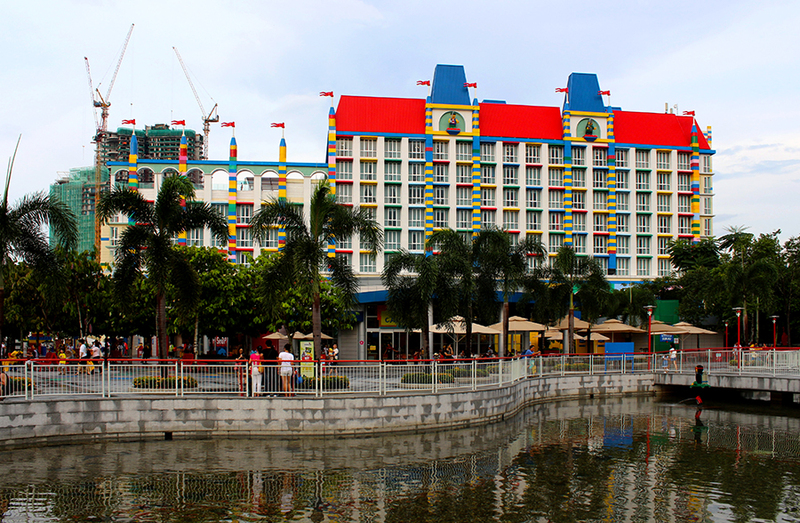 The LEGO-inspired detailing of the Legoland Hotel facade. Nearly everyone I know who grew up in my generation had their affair with the LEGO. There were other toys before that but most did not offer much of a breakthrough compared with the creativity and imagination inspired by the LEGO. I loved drawing when I was a kid and our bedroom walls were proof of that passion. I know my parents had no problem repainting them regularly. I had the drawings and the building blocks of the LEGO to work and to build with. Growing up, I believe I enjoyed the high feeling created by the smell of freshly poured concrete and the way things were put together. Everything fell into the right places. I knew I had to build. I wanted to be an architect. And so an architect I became. So now needless to say, I found this Legoland trip right up my alley. The Big Shop. 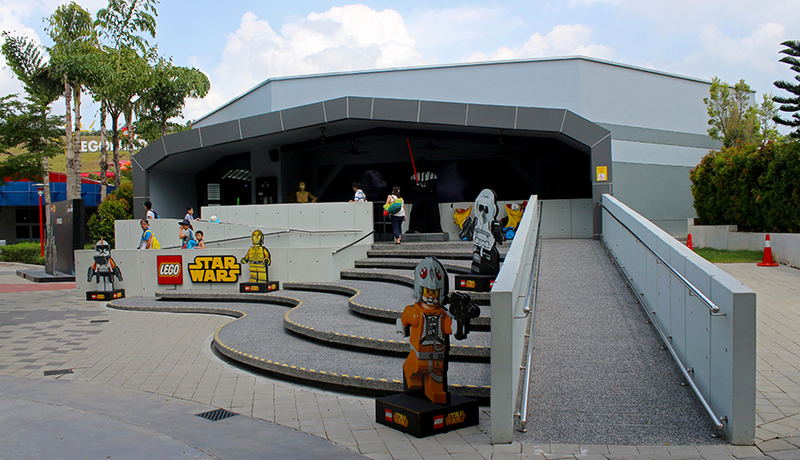 The place for the ultimate LEGO fan. At the facade level, the place looks just like your usual theme park designed only for children. And like most theme parks I know, the place could be really hot and sweltering (sadly though, it actually rained most of the afternoon). Unless you’re a LEGO fan, have children, or just plain curious; I am not sure you’ll think of coming here almost all by yourself. But what awaits inside is something that can thrill people of all ages. Honestly, for a moment I was a child again (I was trying my best not to make it sound like second childhood). The park has several attractions (namely: The Beginning, Lego City, Miniland, Land of Adventure, Imagination, Star Wars, Lego Kingdom, Lego Technic, and Water Park). Depending on who you are with, your interest and your bias; you could spend an entire day in just any two or three of the attractions. I tried some of the rides (the “adult-friendly” ones) if only to make use of the RM235 I paid to get to this park :-). The last time I took a crazy ride was with my daughter when she was 12 years old. I was a little younger back then and I was happy having created that memory for her. Nowadays, I would have none of it :-). Water Fun. 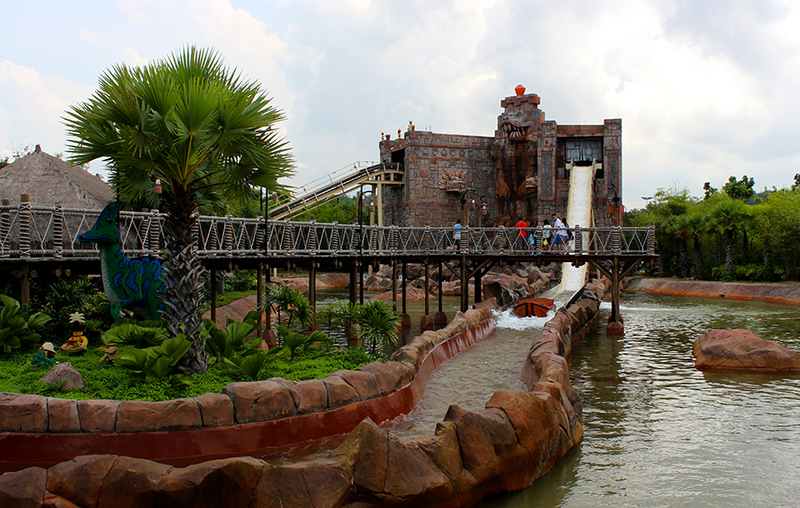 Take the plunge at the Dinosaur Island. Imagination. 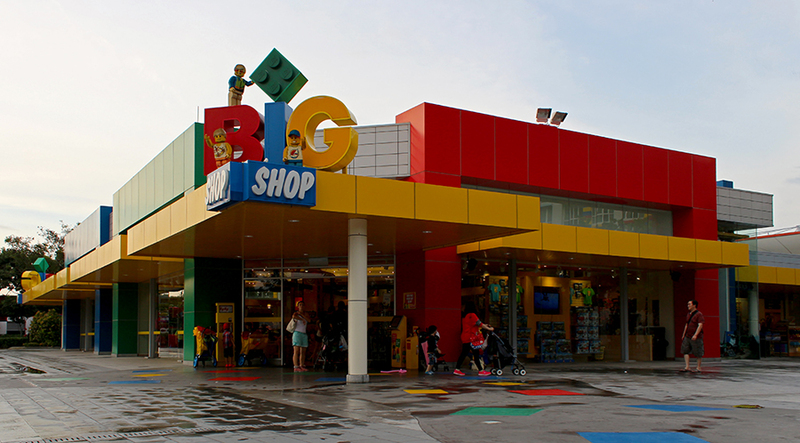 This is the place for the true LEGO fan where families can build and play with the LEGO bricks. 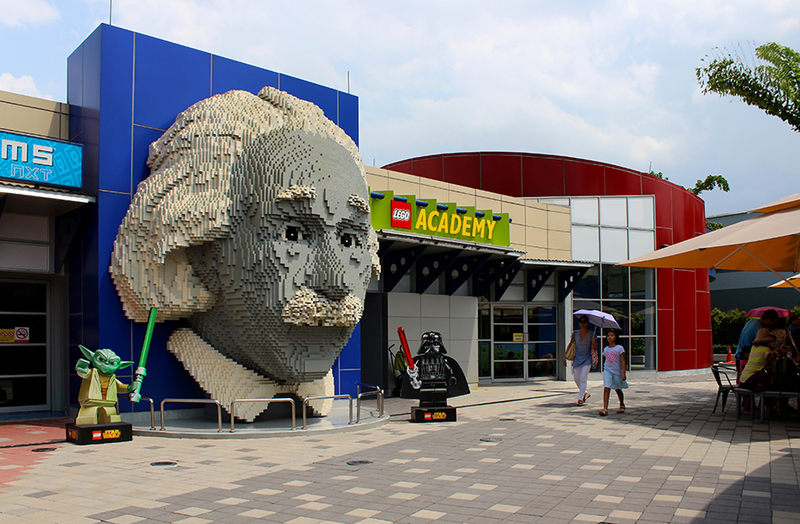 LEGO Academy. This area is also home to Mindstorms, where you can build and program LEGO robots. 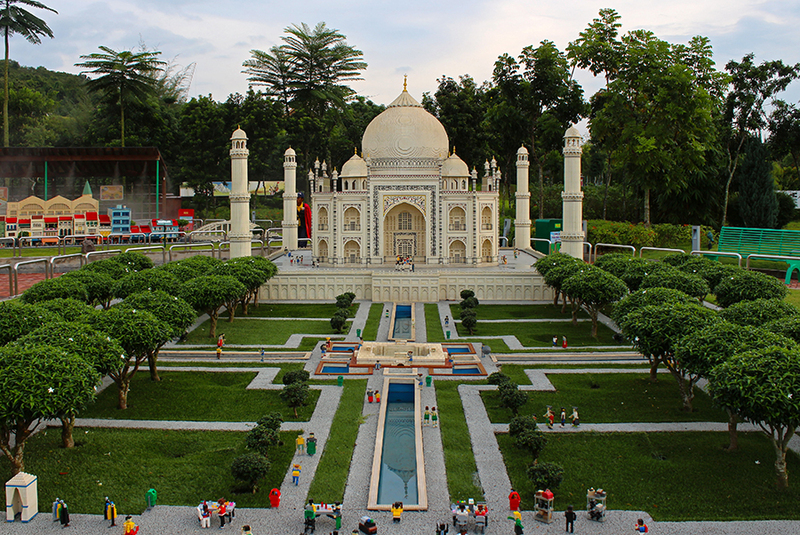 Not surprisingly, what caught my attention was Miniland: a miniature showcase of some of the iconic buildings of Malaysia and Southeast Asia. LEGO released its architecture series a few years ago and featured some classic American buildings as part of its collection. But to see some of the Asian buildings in a LEGO rendition and in a very impressive scale was a real treat. I have seen some of the actual buildings so I couldn’t help but look closely at the miniatures. The level of accuracy and detailing was absolutely incredible! Back in our time, models were made using wooden blocks or cardboard to show clients the massing and placement of buildings. Those however did not include details as we know them now. Much of what’s to be expected was left to the actual completed structure. A LEGO version of the Singapore Marina Bay Waterfront buildings with the Merlion Park in the foreground. 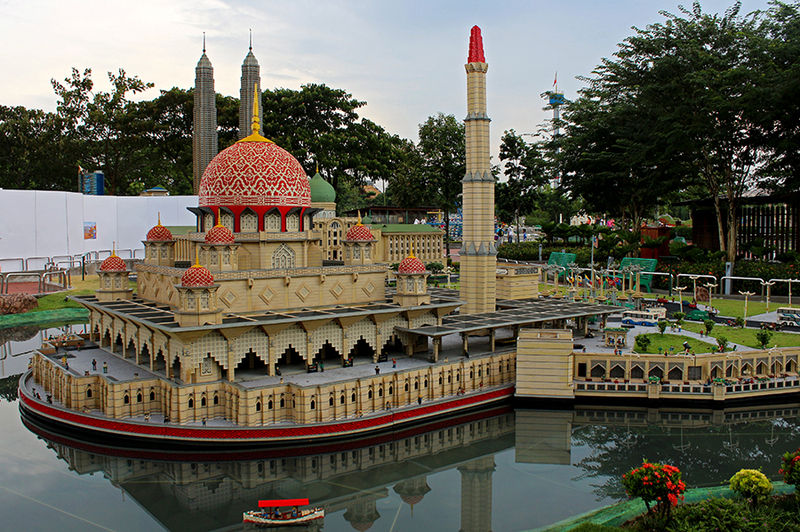 A LEGO rendition of the Putra Mosque, the centerpiece of Putrajaya in Malaysia. The Taj Mahal in miniature. The level of detailing is incredible. But you know what surprised me the most at the end of this visit? It’s actually the kids and the families working together on the LEGO. I don’t know where I’ve been lately but honestly, I haven’t seen that for quite a while. I grew up in a time without computers. It wasn’t always the best of times but it somehow taught me the ever-increasing value of face-to-face conversations, collaboration and high-touch, tactile activities; especially in these times when our kids have more facebook friends and high-tech gadgets. It makes us want to consider carefully the balance of the types of toys we give to our kids. Maybe it’s the reason themed places like this still thrive. People still do recognize its significance after all. Star Wars Museum. The latest addition to the Legoland experience. The museum features miniature versions of the Star Wars landscape as well as a new indoor visual experience. My daughter also grew up without a computer. I didn’t decide on that. I just couldn’t afford it back then :-). The only good that came out of it was that she learned how to draw and to work with her hands (yes, she also knows how to draw. I even tried to sell her the idea of taking up architecture, but in vain). Thanks to the upcoming movie installment of the Star Wars saga, the LEGO is back again with its Star Wars characters collectibles; and it’s a funny and creative way to get my daughter interested in the LEGO (of all things, she bought a Darth Vader key-chain / LED light to start with). Now, whether or not this interest will lead her to the path of her lifework is another story. Until then, I wait :-). See you in my next post. Cheers! Click here to browse through the photo gallery of this day trip.